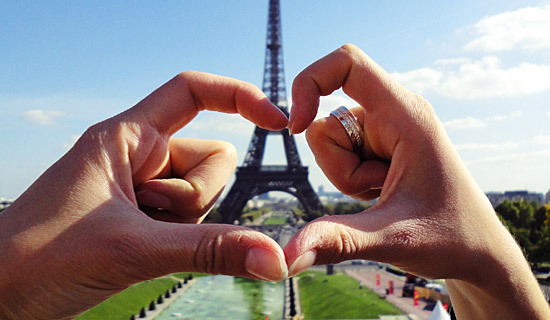 What could be more romantic than a dinner cruise by the Seine to celebrate Bastille Day on July 14th ? 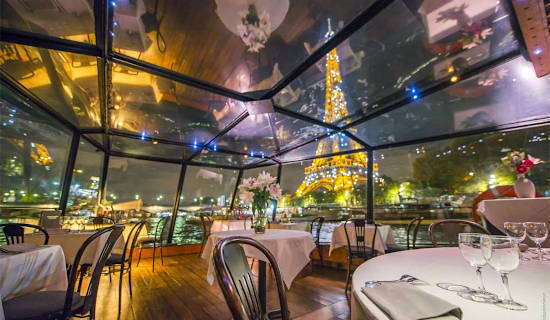 You will enjoy special menus in a refined set and you will have a great view through the large windows of the boat the most beautiful monuments of Paris that will pass by throughout this unforgettable night, that will end at the Eiffel Tower for the Bastille day Fireworks. BE CLOSE TO THE EIFFEL TOWER FIREWORKS! 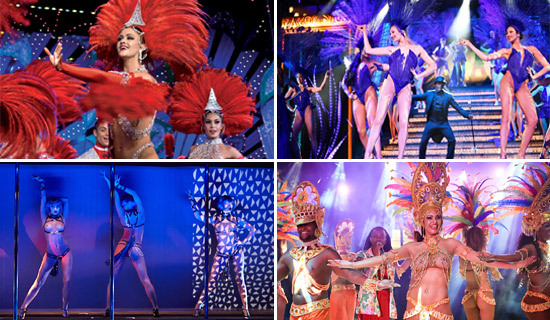 To celebrate the 14th of July, we propose a magical evening aboard the boat Tosca. Gala Menu and Privileged Location for Fireworks. DINER CRUISE AND FIREWORKS ON THE TENNESSEE ! Enjoy a gourmet meal on the magnificent sternwheeler "The Tennessee" for two hours before the 14thof july fireworks. 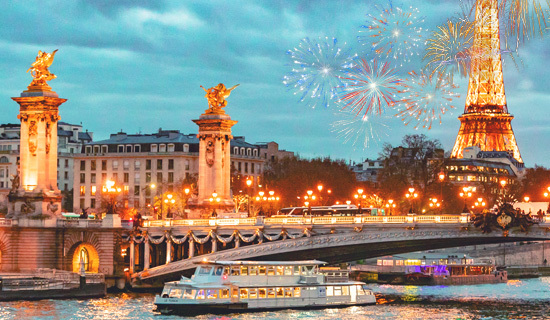 The Bateaux Mouches let you fully experience the Bastille Day with an exceptional celebration including a Champagne dinner cruise followed by the fireworks, to be admired from the boat's panoramic deck. Gourmet menu : Starter + main + Dessert + Champagne ! 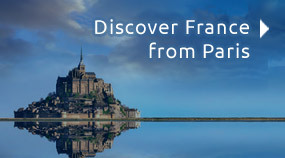 Start your Bastille Day evening in Paris with a festive and unique moment. 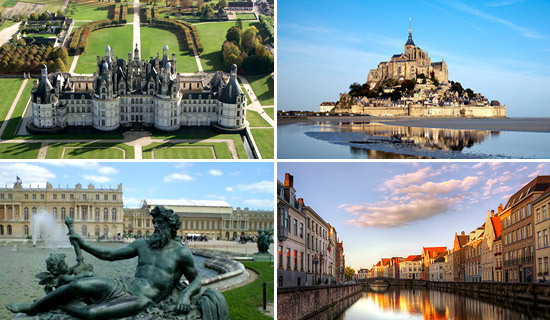 Enjoy our 2 Champagne special cruises with a full 1-hour tour through Paris to discover the quays and monuments from the Seine, 1 glass of champagne included, and a bar on board ! Gourmet box, glass of Champagne and Fireworks at the Eiffel Tower ! 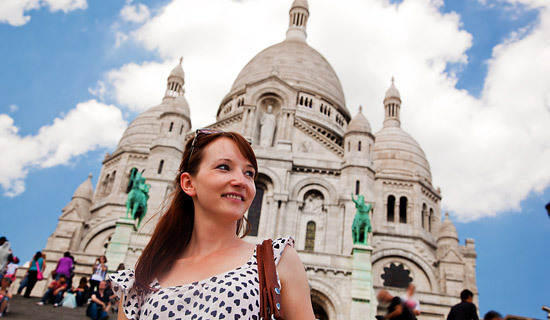 To celebrate Bastille Day in Paris, France Tourisme offers an exceptional cruise at keen price ! 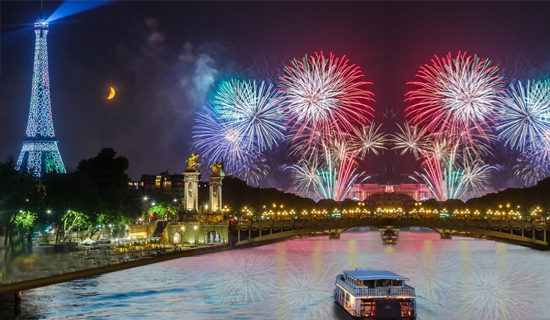 Take a cruise, departing from the center of Paris to watch the fireworks from the Seine, accompanied by a gourmet box and a glass of Champagne. 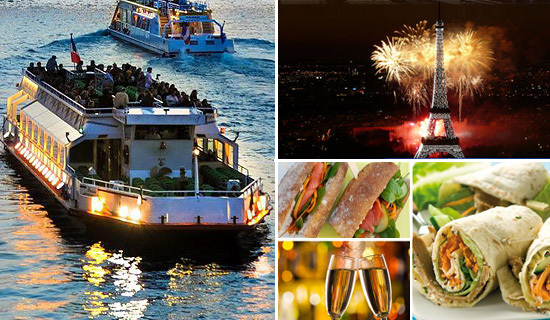 A magic Bastille Day with our dinner cruise on a luxury boat. 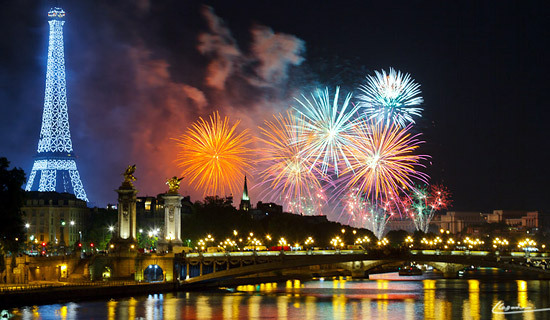 Cruise by the Seine, a Special Bastille Day menu during the cruise and Stop near the Eiffel Tower to admire the Fireworks, are the ingredients to take full advantage of your 14 July in Paris. 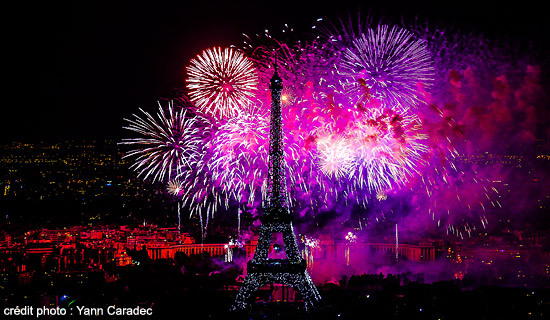 A magic Bastille day with a fantastic view on the fireworks ! 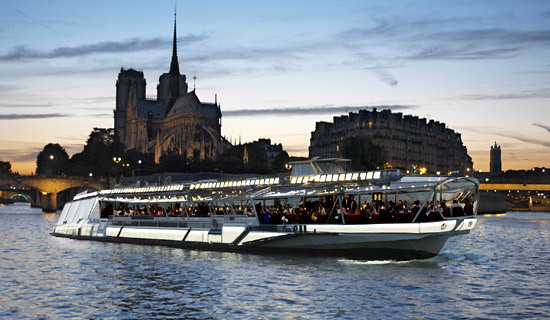 Come on board of the Boreas for your Bastille Day evening in Paris the 14th of July ! 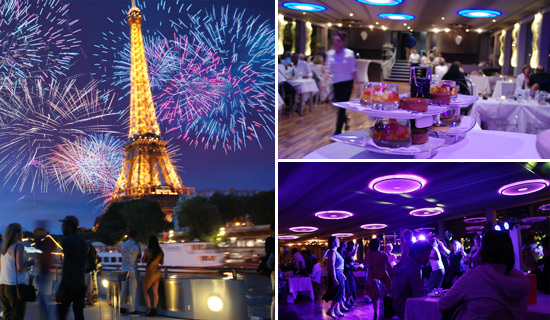 You will enjoy an exceptional dinner cruise onboard an authentic boat dating from the beginning of the 20th century that will sail during 4h30, and get ready for an incredible evening... And let's not forget your rendez-vous with the Eiffel Tower and its fireworks ! 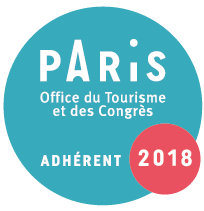 An opportunity to celebrate the 14th of july and discovering Paris by night. 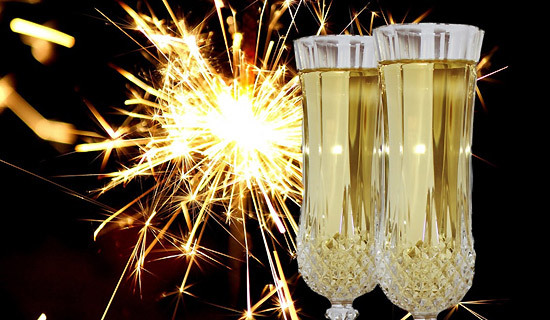 You will enjoy the lights of Paris, the fireworks and a menu with Champagne ! 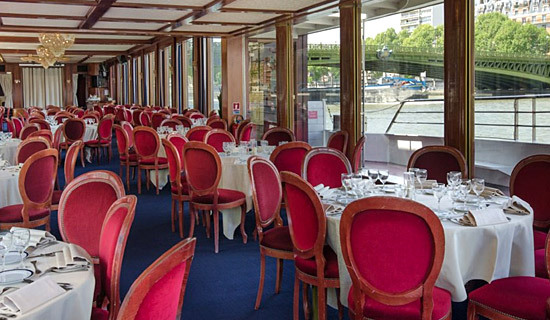 July the 14th dinner cruise on the "Diamant Bleu"
An axceptionnal evening on a luxury boat ! 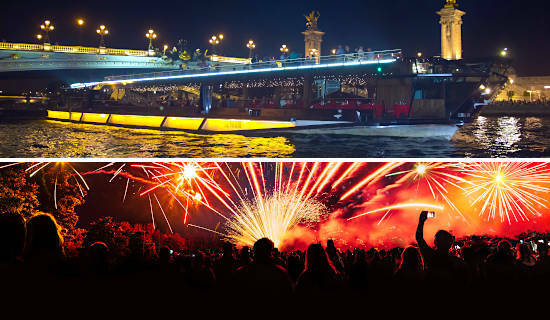 We invite you to celebrate the Bastille Day in Paris on board of a modern and panoramic boat. An exceptionnal dinner cruise which ensures you one of the best places to admire the fireworks on the splendid Terrace of the boat. A musical ambiance will be proposed during the cruise.